One day last November, over 100 people from different cities gathered in Gia Lai Province in the Central Highlands to start a “trek” across the Ayun Ha Lake. This is one of the grand artificial lakes in the Central Highlands. And the people, young and old, were members of a long-distance swimming club. 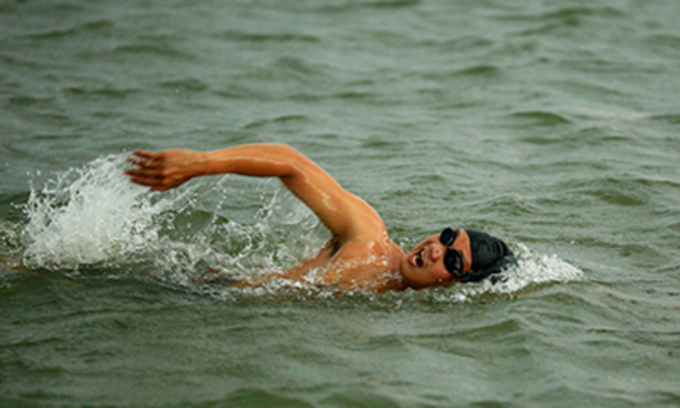 Long-distance swimming is a new sport in Vietnam, and contrary to the perception that it is not for everyone, its popularity is increasing, as can be seen by several clubs being established in recent years. The sport was pioneered in the north of the country, says Vu Ngoc Chien, a member of a club in the south, adding that the members were passionate and ardent. “Sometimes, our club members swam across the Red River when it was 8-9 Celsius degrees, or swam 5 kilometers from the big Co To island to the small Co To island and returned. They have also swum in the windy West Lake, Ba Be Lake (Bac Kan Province), Nui Coc Lake (Thai Nguyen Province), Da Bac Lake (Hoa Binh Province), Thung Nai Lake (Hoa Binh Province), Na Hang hydropower dam, Cua Dat hydropower dam and Chay River (Quang Binh Province),” he says, listing places that the club has already covered. In the south, the very first long distance swimming activities were initiated in 2015. “At that time, there were less than five participants,” Chien recalls. Now a trip attracts nearly a hundred people. Nationwide, there are thousands of people participating in the swimming clubs. The oldest is 81 and the youngest is 7, the latter capable of swimming up to a kilometer. Swim-trekking involves crossing natural water bodies. Participants need both physical and mental strength because the swimming is done in natural water bodies, not swimming pools. To maintain strength throughout the distance, the swimmers need to learn long-distance skills. “It is important to be resilient, because swim-trekking does not last for a few hundred meters, sometimes the distance can exceed 10 kilometers,” Chien says. Someone who can swim “incessantly in a pool” might not been able to swim outside, he stresses. The members use safety equipment, of course. They all have life buoys that are tied to a rope connected to another swim-trekker at a distance where the flow of the group is not disturbed. 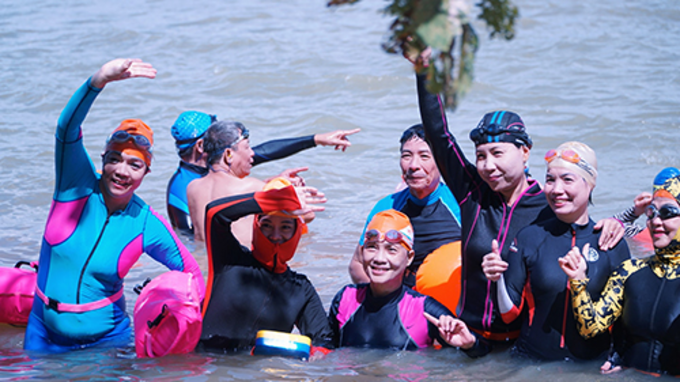 Depending on the tophographical features of a swim-trek area, participants have to ensure they can meet minimum requirements including swimming for 2 kilometers, diving and so on. Nguyen Anh Tuan, organizer of a swimming club, says that water in hydroelectric dams in the mountains is often very clean. Therefore, swim-treks take place once a month, not more, usually. So far members of Tuan’s and Chien’s club have been to Ho Tram, Tri An and Da Ton lakes, but the biggest event of last year was the artificial lake in Gia Lai. “We had to ask for permission from the lake management board to organize that swim-trek,” Duc said. Quoc Tien, a first-time long distance swimmer on that trek, said that he was very scared after the first 500 meters. “… I wanted to go back. I had to tell myself that ‘I can do it’ repeatedly to overcome the challenge,’ said Tien. Many participants bring their families along, to combine swimming and a scenic excursion. They see membership in the club as an opportunity for the whole family to travel together, to improve their health, and to go on a journey of self discovery.